Like all our prior blog polls, this post takes a moment to memorialize the results we recieved on the most recent blog poll. 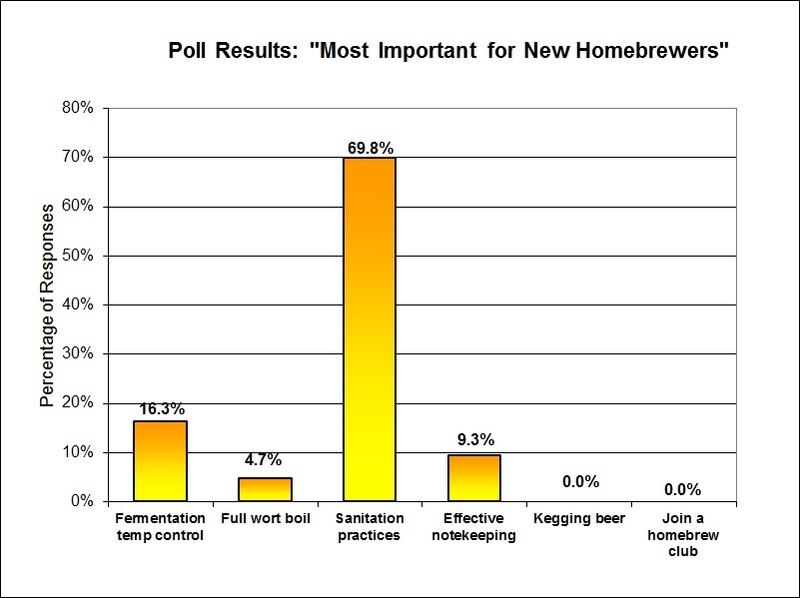 The readers' responses to the question "What is the most important thing for a new homebrewer to focus on?" are presented below. This was one of the more enjoyable polls that we have done in a long time. It was a real get back to basics topic. Many times, we are guilty of focusing on advanced or peripheral topics in homebrewing, but the fundemental building blocks are way more important than anything else when it comes to brewing beer. 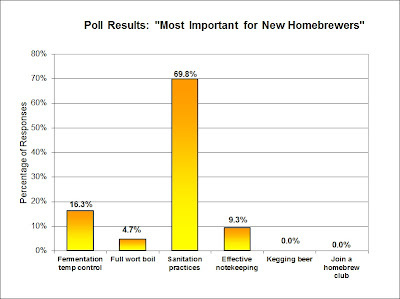 Focusing on the poll results specifically, its really no surprise that good sanitation practices is considered such a critical element for homebrewers. Without the ability to control microbe populations in and around our beer, the resulting beer would be a crapshoot - a completely random beverage that would be more times undrinkable than drinkable. For begining homebrewers, learning to properly sanitize equipment and how to handle the wort on the cold-side is the first step in producing repeatable results. But sanitation is certainly not something just for beginers to consider. It is a concept that everyone should strive to improve. If you've been brewing for years and have a set process, ask yourself "how can I improve my brewing sanitation?". Where is the most likely place an infection might jump into my beer? Continuous improvement should be the mantra homebrewers adopt - make small improvments whenever you can and your brewing will continue to improve right along side. We will likely return to this topic in future polls, so let us know what you think. And if you are reading this, our next blog poll is up and awaying your participation. "What contemptible scoundrel has stolen the cork to my lunch?